Two more announcements!Our previous news message read that indie title Counterspy was coming to PS3 and Vita according to Sony’s very own official US PlayStation blog… Which has now revealed two other indie titles to come to Vita, PS3 and the PS4! The first is Hohokum, is a joint project between artist Richard Hogg and Honeyslug, a London-based game studio. The player takes the role of a colourful flying snake, which moves around the word in a “mesmerizing way” according to the developers. Hohokum will release in 2014. One of the main aims for Hohokum is to create something where the usual pressures of videogames – constantly being told to do things, fearing failure and being challenged to earn progress – were all absent. This is quite a challenge, but we’re really excited about how it’s coming together. There are goals and secrets to discover. There are even Trophies. But at its heart Hohokum is a playground, a place to wander about, perhaps even lose yourself in. In Doki-Doki Universe, you’re a robot named Model QT377665, or QT3 for short (QT – get it?). Your human family said to wait here on this asteroid, and they would be right back to get you. To make matters worse, an alien that looks like a green hot-dog, named Alien Jeff, finds you and gives you some bad news: It turns out your model is getting recalled and scrapped, because you apparently don’t have enough “humanity”… whatever that is.That was 11,432 days ago. Bummer. Alien Jeff has been assigned the task of discovering just how much “humanity” you are capable of, and reporting back to the company. 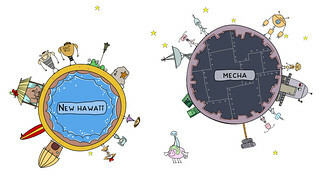 So as you travel around the Universe on a giant flying pig (or whale, or poo, or whatever you choose) and visit themed planets (cute, scary, gross, robot, ice, etc.) you’ll interact with hundreds of some of the most bizarre characters you’ve ever heard of, and Alien Jeff will be watching you the whole time. Doki-Doki Universe is a mash of an RPG, life-simulation and an interactive story game. You’ll be able to interact with the world and other players in various different ways. The release window for the game is currently unknown, but since the game will release on PS4 expect to wait a bit longer. Both of these seem fascinating I am not generally one for sandbox games (I tend to get bored and want to continue the narrative) but I have found more and more that shorter, lighter indie titles are my favorite way to explore the genre. Journey certainly comes to mind here, as does the much darker Don’t Starve. 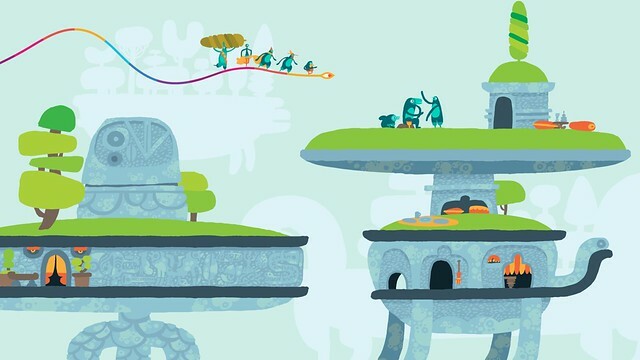 Especially love the art direction for Hohokum.